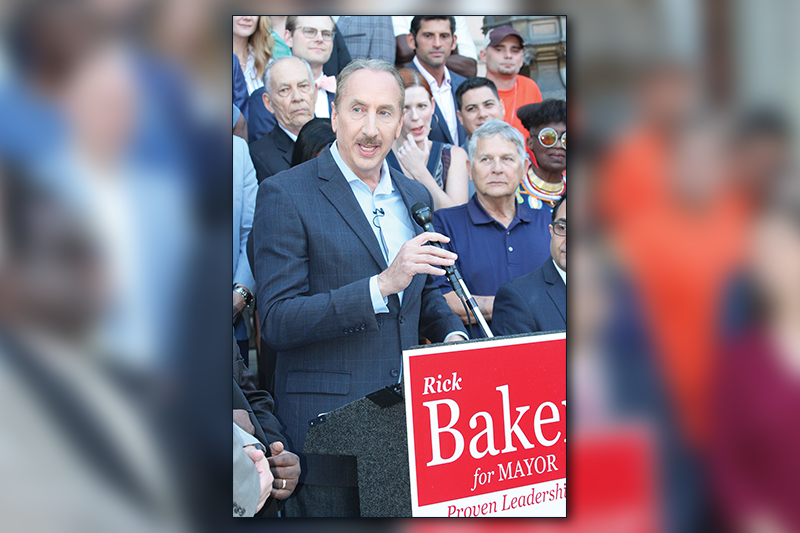 Former Mayor Rick Baker announced his candidacy for mayor on Tuesday. 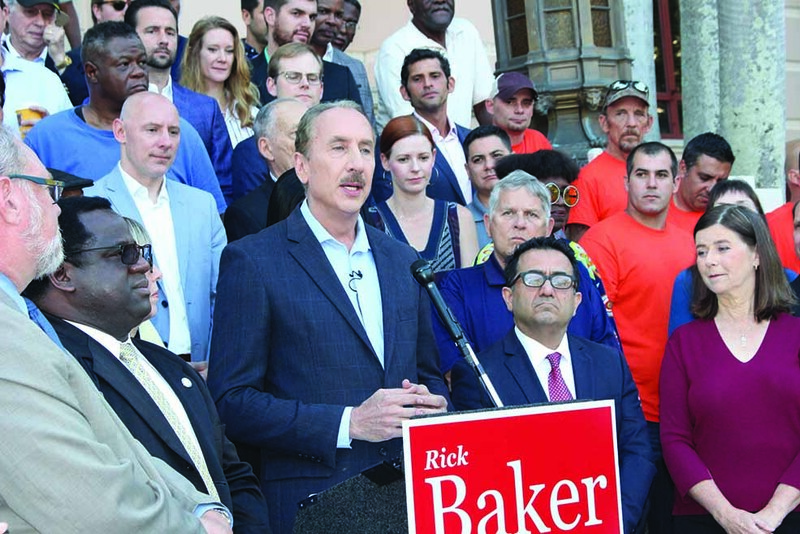 ST. PETERSBURG – A familiar name will be on the ballot as former Mayor Rick Baker formally announced his intention of running for mayor once again, this time against incumbent Mayor Rick Kriseman. Standing on the steps of City Hall Tuesday morning, Baker made an impassioned speech that lasted more than 30 minutes. The former mayor has not been entirely absent from public life as he has recently been part of the Tampa Bay Rowdies’ campaign for a referendum that would allow the soccer team to upgrade Al Lang Stadium. Baker extolled the accomplishments of his past administrations, including the building of new recreation centers, libraries and pointed out that he worked with the neighborhoods to improve St. Pete. He also underscored his support for schools while mayor, by supporting principals and teachers with housing loans, raising money for scholarships or even getting corporate partners for every school. His administration worked closely with the police department to make St. Pete a safer city, Baker said, noting that this included creating a street crimes unit that “substantially” increased the number of drug arrests. Violent crime and murder rates had gone down by the time he left office. He pointed out the re-energizing of downtown with the arrival of such companies as Duke Energy, a new learning center in the form of a St. Pete College campus and the overall revitalization of the arts and cultural scene. “Early on in my years, I declared St. Petersburg to be the cultural center of Florida. And that’s something I like to do—I lie until it becomes true!” he quipped. Baker stressed that unlike Kriseman, he acted as his own spokesman, his own community emissary “to deal with the issues of the community and listen to the people,” and his own chief of staff. “You know, we have a chief of staff now that I think a lot of people wonder who’s running the city sometimes,” he said. Returning to the accomplishments of Midtown, where Baker said his administration “did so much,” he said that Kriseman actually did keep that campaign promise of his to not put up any buildings in that neighborhood. “He said, ‘You know, I don’t believe in building buildings like Mayor Baker, I believe in helping people!’” Baker said. Baker said it was Kriseman’s administration that “ignored” the grocery store. He said the stupidest thing he’s ever heard came from a letter written by the deputy mayor that said Midtown couldn’t support a grocery story. Baker said that the mayor ignored the votes of the public for a local architect’s design and chose another design over it—one that furthermore couldn’t be done for the budget that had been set. In 2001 when he took office, the city was under a DEP order to fix its sewer system, Baker explained. During the following nine years, the city spent $160 million on water and sewer capital improvements. At the end of that period, in 2010, Baker said the city was off the DEP consent order and was named the best-maintained big city sewer system in the state. After closing the plant, Baker said 50 million gallons of sewage was dumped into the bay. The city had gone more than 15 years without a major spill up until that point. Such dumping “kills the health” of the bay, he said, and impacts the city’s economy because people start to wonder about the city’s reputation. In turn, he asserted, it affects our quality of life. Former City Council member Leslie Curran, who had endorsed Kriseman on his path to becoming mayor, now supports Baker as she believes Kriseman has fallen short of his promises. “The race is on,” Baker said, challenging Kriseman to debate him.